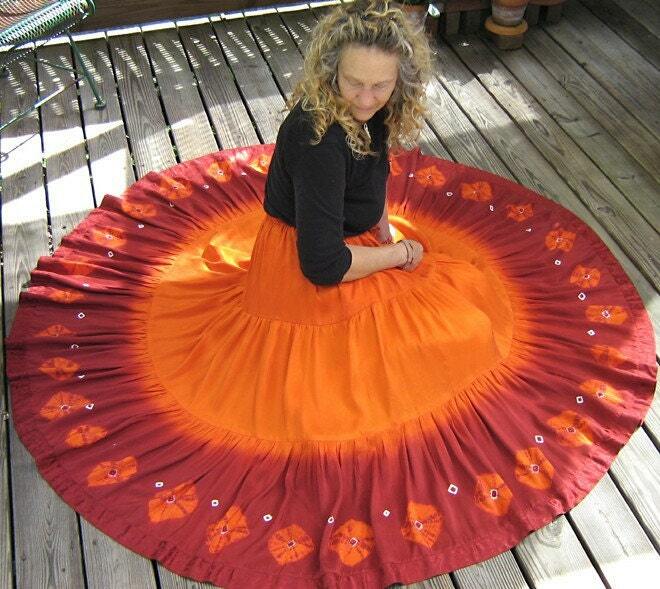 Roundabout Dancewear designs pure silk, hand-dyed, hand-sewn dance skirts and pants lovingly made by long-time circle dancers, heather and David in their country home. heather does most of the sewing and dyeing while David creates most of the Shibori. Made by dancers for dancers, their stunning clothing can easily be worn for any occasion. Tell me about how you originally got into your craft, heather. I was, and still am, a knitter and David was learning how to spin. He attended a weekend natural dye workshop for wool and close to the end of the class the instructor spoke on Shibori and he bound and dyed his first scarf. He was ever after in love with this technique. A year or so passed with many scarves dyed and we attended a yearly Circle Dance Workshop in the High Sierras where a dear friend brings her “Flying Skirts” for the dancers to purchase. On our way home we were talking about Shibori and somehow the conversation went from “I wish we could work the Shibori on clothing rather than scarves.” After a month or two I was buying silk and making spinning skirts. We were off and running. The pants came a bit later as a suggestion from one of the Circle Dance men. He said the guys need beautiful garments to dance in also. Hhmmm, I would have to say it is a cross between Circle dancing, hiking and playing. I have been working toward listing something every day on ETSY. That is terribly difficult when life comes at you when you are least expecting it to. A dancer, a singer, a model, an astronomer, an archeologist, an artist. I was a graphic designer for 30 years and retired at age 50 a few years ago. I have been teaching Circle dance for 22 years. I took voice lessons and learned to sing Italian Opera. I always watch the stars, and I still pack around 20 boxes of fossils. I feel I have been able to be all of these. Oh, and I get to model the clothing in our shop. It is a good life. AH, the future! All I know is now, and now, and now. We are working toward being in the Public Radio Crafts Fair in San Francisco in December of 2009. We will apply later this year. Maybe we will be accepted into the show. I certainly hope so.